The Chevy Cruze is a good car for the money, it handles well, has good acceleration, firm but comfortable seats and is relatively quiet. Its not a great car, but a good one, on a par with the Dodge Dart – the new one, not the one from the 60’s – although those old Darts were well nigh indestructible… we will have to wait and see if the Fiat Darts live up to the original’s. The Cruze was the first of an influx of Korean cars made by Chevy – it was followed in 2012 by the Sonic and now in 2013 with the Spark. The Cruze and the Sonic share the same manufacturer, but that’s pretty much where the similarities end. The Cruze rides better than the Sonic, the seats are more comfortable, and the handling is better… all things you would expect considering the Cruze is several thousand dollars more than the Sonic and many thousands more than the Spark. In terms of styling the Cruze is not as interesting as the Sonic. Where the Sonic seems to be taking its styling cues from a motorcycle showroom the Cruze is more pedestrian. While the Sonic is targeting younger, first time buyers, the Cruze is positioned as the car Spark and Sonic owners move up to… unless they don’t have kids, then they can have some real fun and buy a Camaro. 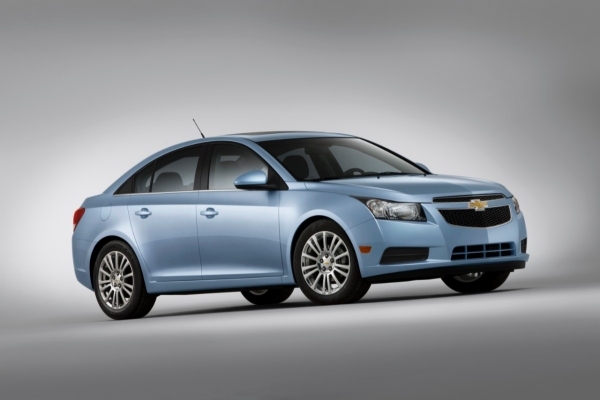 The Cruze LT features a cloth mesh over hard plastics instead of soft-touch materials. 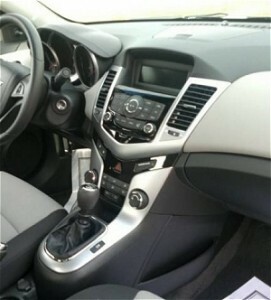 One odd thing about the interior of the Cruze LT. the LT loses the two-tone seats standard on the LS, but the dash is odd. Instead of soft-touch materials as many manufacturers are using, the Cruze covers its hard plastic with a matching cloth mesh. At first I liked it but the more I thought about it, its just odd. Plus, as my wife pointed out, the cloth seems designed to collect dust and dirt. It’s all I can do to vacuum the seats, I don’t want to have to vacuum the dash, I would rather just wipe it down. Overall the cloth is a porous substitute for soft-touch plastics. Cruze LS Center Stack and two-tone seats. The Cruze is available in five different versions beginning with the LS. Starting at $17,940 the LS is the least expensive Cruze and it shows. Other than the seats the interior is mainly hard plastic but it does have some character. What Chevy refers to as the “center stack” (the radio and climate controls) is surrounded by silver-painted trim. Also, the very readable dashboard gauges have silver accent rings. You might not like the two-tone seats, but at least they add some contrast. Most cars in this price-range tend towards black cloth seats surrounded by black plastic. Chevy deserves credit for breaking up the monotony. Also, the LS has some nice touches, like express-down for all power windows. 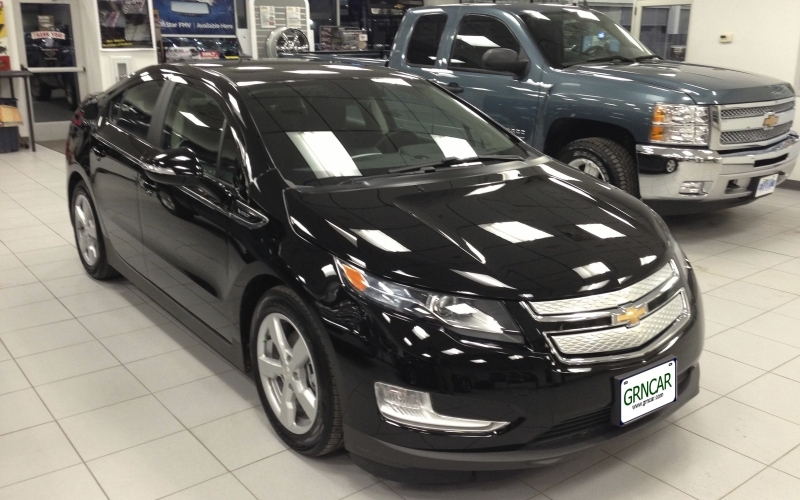 A step up from the Cruze LS is the LT, the version most Chevy dealers are stocking up on. The LT costs $1,430 more than the LS and has as standard a leather wrapped steering wheel, cruise control and 16” alloy wheels (replacing the 16” steel wheels on the LS). The nicest thing about the LT is some of the available option packages. 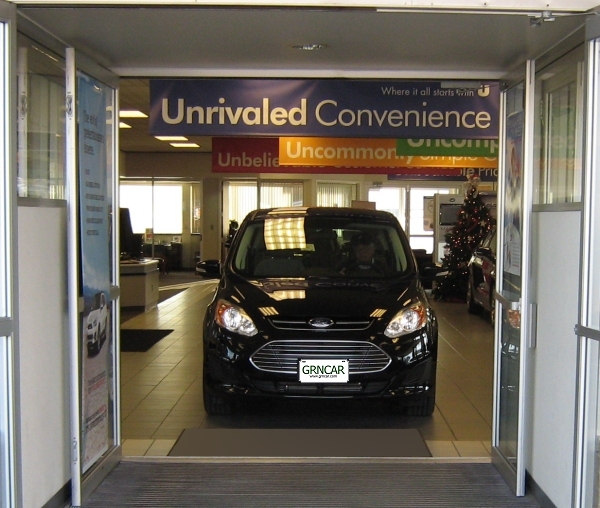 For not too much more money the Driver Convenience Package offers a lot; it adds a six-way power seat, outside heated mirrors, and remote start (but only with automatic transmission). 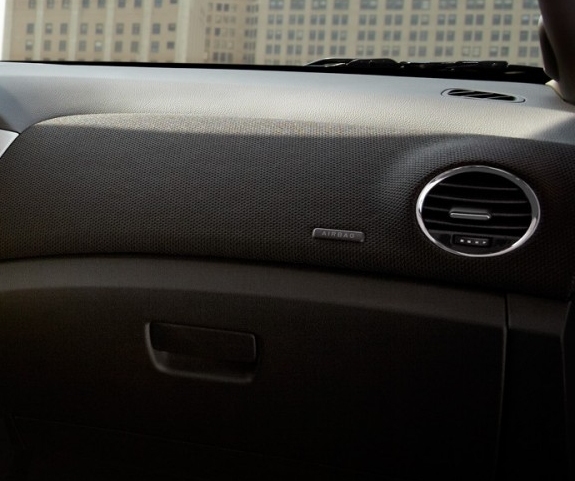 A new, optional, Technology Package includes Chevrolet MyLink and a rear vision camera. More about MyLink later. If gas prices start going up again the Cruze Eco will be worth a look, especially if you do a lot of highway driving. Starting at $20,490 the Eco package adds 17” lightweight alloy wheels, a front facia air dam and a rear spoiler to reduce wind resistance and boost the miles per gallon to 28 in the city, 42 on the highway. Unlike the Malibu Eco with EAssist, (Chevy’s mild hybrid system) the Cruze Eco does not automatically stop and start its engine when the car stops moving nor use regenerative braking or a lithium-ion battery to improve miles per gallon, it relies on light weight and aero-dynamics. The Cruze 2LT is essentially the same as the LT but adds 6-way power, heated, leather seats as standard and adds $2,480 to the price of the LT. Last of all is the Cruze LTZ which takes virtually all the available option packages and includes them as standard. The LTZ comes with 18” wheels, automatic climate control, rear vision camera, driver and front passenger illuminated vanity mirrors, outside heated, power-adjustable, body-color mirrors, front fog lamps, chrome door handles and keyless entry/keyless start. The LTZ starts at $24,360. More cars than ever are offering some form of voice activated communications, either standard or as an option. It started with the Ford SYNC system which, depending on the Ford in question, can do everything from placing your phone calls, to playing music based on the artist’s name to setting your climate controls. Now Chevy has their version of the SYNC system called Chevrolet MyLink. An identical system is offered to other GM customers but is known as IntelliLink. MyLink allows users to link their smart phones to the system for voice activated calling plus have access to music and turn-by-turn navigation. Apps such as Pandora and Stitcher can be downloaded and then voice controlled. MyLink also provides vehicle health reports (similar to the reports provided to OnStar customers.) OnStar is still available but is being repositioned as a package of safety services such as road side assistance and route navigation. For the test drive I selected a Cruze LT. I found the Cruze better than average. It’s quiet, handles well and has good acceleration. The seats are comfortable and well shaped. Real world mileage seems to be around 24 miles per gallon (combined city and highway driving). The LT has Chevy’s ECOTEC 1.4 liter turbo-charged engine as standard. While it doesn’t have as much horsepower as some of its competitors the additional torque more than makes up for it. What I liked best about the Cruze was the handling. Its feels kind of sporty, something that larger Chevys, like the Malibu, are distinctly lacking. I would still give a slight edge to the Volkswagen Jetta in terms of overall drive-ability but the Cruze isn’t bad at all and is surprisingly quiet. If you’re interested in the Cruze, some of the other cars to consider are the Toyota Corolla, Subaru Impreza, Honda Civic, Nissan Sentra and the Ford Focus. Unfortunately, one of my favorite cars, the Volkswagen Jetta, has been found lacking in terms of reliability. While the Jetta offers one of the best combinations of handling, visibility, and comfort, it is reported as among the least reliable by a leading consumer magazine. J.D. Power also shows the Jetta as below average in reliability. The last Jetta with an average predicted reliability score was built in 2008. Quick Reference Table – Comparable sedans equipped with automatic transmission. Signaling exterior mirrors N.A. Standard N.A. 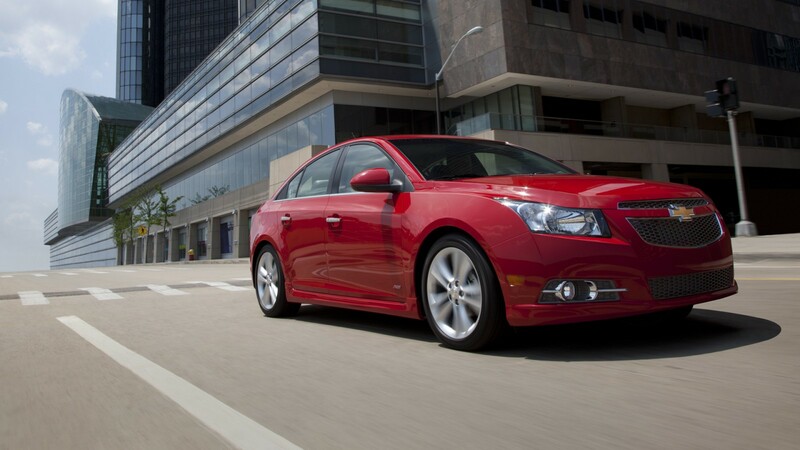 Since its introduction in 2012 the Cruze has been reported by a variety of sources as having average reliability. These days average isn’t bad. Overall cars are much better made than they were 20 or 30 years ago. The difference between a car with above average reliability and one with average reliability is just a few more problems per thousand vehicles. The Chevy Cruze is a pretty good car. It doesn’t have the dramatic styling of the Ford Focus but there is nothing bad about it. It’s quiet, has good handling, decent acceleration and visibility. When choosing between the Cruze and the competition your decision might come down to the final price. There are plenty of Cruze LTs available and it shouldn’t be hard to find one for at least a thousand dollars less than the sticker price. If you have any questions about the Cruze, feel free to leave a reply. I try to answer questions within 36-hours, often sooner.